Most climate change campaigners focus on the fossil fuel sector. While it’s essential that we move away from fossil fuels if we’re to avoid an ongoing climate catastrophe, we must also move away from animal agriculture. 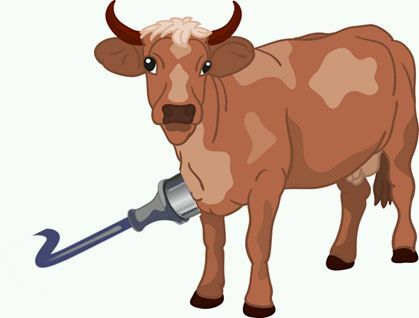 The concept of the electric cow aims at providing some context to livestock’s greenhouse gas emissions by comparing such emissions to those of: (a) electricity generated by fossil fuels; and (b) aluminium smelting, the end product of which is known within the industry as “congealed electricity” due to its enormous energy requirements. The answer is that, if cows and other farm animals ran on electricity instead of food, water and oxygen, and greenhouse gas emissions were used to measure usage, then our current level of electricity generation would be insufficient to supply Australia’s current food mix, even if we ceased using electricity for other purposes. That’s in a country that relies primarily on coal-fired power and is one of the highest per capita emitters in the developed world. If your daily food intake includes a 200 gram steak (less than half a pound) from a grass-fed cow, you may be generating around 60 kilograms of greenhouse gas. If you replace the steak with (for example) kidney beans, tofu and soy nuts (dried soy beans), you’ll get plenty of protein and produce less than 3 kilograms of greenhouse gas. While it’s true that carbon dioxide from the burning of fossil fuels will remain in the atmosphere for much longer than methane belched by cows and sheep, methane’s shorter-term impacts can become long-term to the extent that they contribute to us reaching climate change tipping points with catastrophic and irreversible consequences. Land clearing is also a critical factor, resulting largely from livestock’s inherent and gross inefficiency as a food source, with the need to use far more resources, including land, than would be required if we generally adopted a plant-based diet. 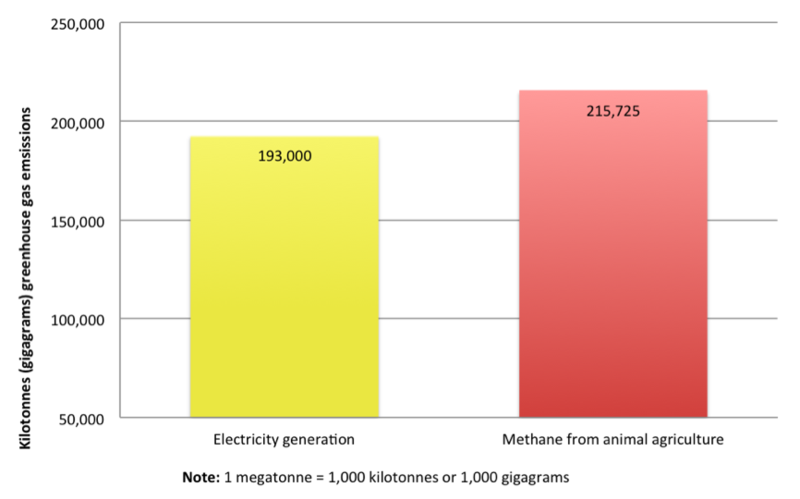 Here’s the slideshow, followed by some details on Australia’s livestock-related methane emissions compared to those from its electricity generation. I have used the IPCC’s 20-year GWP for methane of 86 (including climate carbon feedbacks). That is a conservative figure relative to NASA’s estimate of 105. The analysis shows that, even before allowing for factors such as land-clearing and nitrous oxide emissions from manure management, the emissions from animal agriculture in Australia are more than those from electricity generation, most of which is coal-fired. This is post was updated on 9th July, 2014 and 15th October, 2015. The 2015 update comprised the inclusion of the material under “Further details”. [v] Australian Government, Dept of the Environment, op. 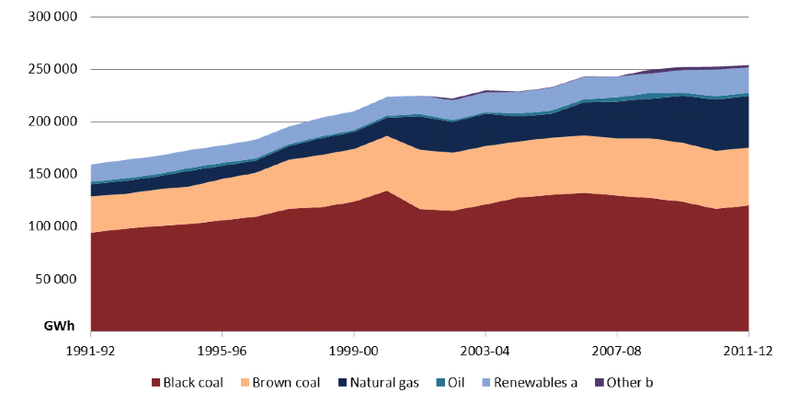 cit., Figure 3.2: CO2-e emissions from electricity generation by fossil fuels, 1990–2012, p. 50.